Now here's something you don't see every day. My pal David Lovesy blowing up an inflatable rubber doll. A male one at that! In a theatre! In public! What on earth is going on there then? To find out why, you will have to come and see Fawlty Towers which is on at the Chrysalis Theatre in Milton Keynes as mentioned previously in this very blog. On Sunday, we had our last rehearsal and - apart from our 'dead body' falling through the bottom of a wardrobe - it went rather well. This is the last blog post I shall do on Fawlty Towers as this week's MKTOC production is the last time we'll ever do it. It's been a wheeze producing it on and off over the last 5 years, so do come along to see it if you can. "However, there's plenty going on in my world besides the Fawlty Towers production." My band The Bolivian Sunshine Dogs played the food festival at Olney to a great audience on Sunday lunchtime. We even did White Christmas at the end complete with snow machine. Ok, as soon as our slightly out of sync tones stopped reverberating around the town, and the local dogs had stopped howling, I had to leg it sharpish to the theatre for the Fawlty Towers technical rehearsal. I'd rather over booked myself this weekend, but ... well ... it's not the first time I've had to make a run for it at the end of a gig. I'm getting ready for the panto season as I've been offered a possible pre-season panto tour in October/November then I'll be into Cinderella as an ugly sister for December in Haverhill which I'm also directing. I'm doing a lot of magic workshops for Pauline Quirke at her academies, so if you want to learn how to cheat at cards or even pretend to cut off your arm - well you know where I am ... at the Chrysalis all this week. 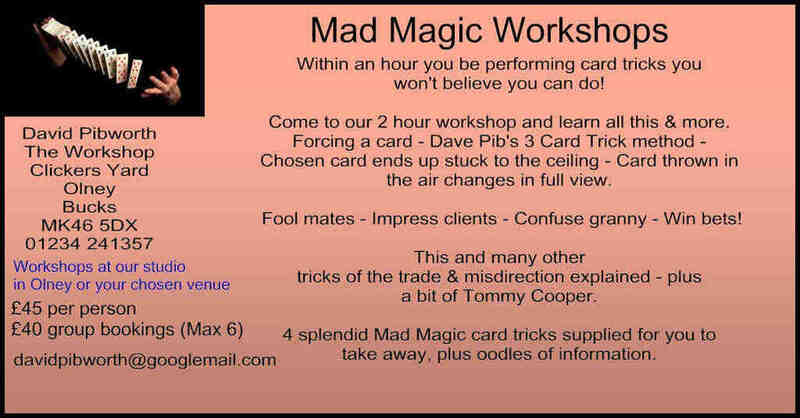 As I do magic workshops for schools and corporates, come and ask me for my card ... I may produce it from somewhere quite unexpected.